The Advanced Warning and Response Network (AWARN) is receiving strong support, expressed by key officials from FEMA, the FCC, the Commerce Department, broadcasters and technologists, and even leading Wall Street analysts and an influential member of Congress, who all participated in a recent “smart spectrum summit” in Washington, D.C. The first-of-its-kind event – Smart Spectrum Summit: Broadcast/Broadband Networks for Public Safety and Other One-to-Many Data Applications – brought together leading figures from across industries and government to discuss the great potential for future uses of our airwaves. A major focus of the conference was on hybrid networks that will utilize the next-generation broadcasting platform, ATSC 3.0. With primary sponsorship by ONE Media and LG Electronics, the intensive day-long event on Nov. 18, 2015, attracted over 120 registrants. The summit kicked-off with a roundtable that focused on new technologies for spectrum utilization. Citing the impact of the ATSC 3.0 standard currently being finalized, Sam Matheny, National Association of Broadcasters (NAB) CTO and EVP, described the power and the uniqueness of “high-power, high-tower, all IP broadcasting infrastructure.” Private equity players John Dooley of Jarvinian Spectrum Ventures and John Kneuer of JKC Consulting provided fresh insights into the value of the one-to-many model of data distribution from broadcasters and the development of secondary spectrum markets. They both saw a major upside for broadcast spectrum. U.S. Representative André Carson (D-IN) gave the well-received morning keynote address. 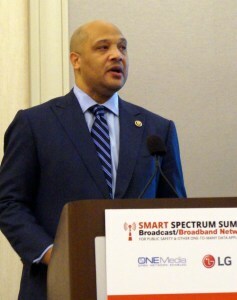 A key advocate in the successful campaign that led to wireless carriers activating the FM chip in smartphones, Congressman Carson specifically praised the potential for AWARN. He recognized the power of ATSC 3.0 enabling broadcasters to provide an overlay for delivering public alerts and mission-critical video to first-responders during emergencies. He said he and fellow members of Congress are ready and willing to support the deployment of next-gen broadcasting technologies for emergency communications, including the ability of future smartphones to receive AWARN alerts. Roger Stone, assistant administrator of FEMA’s National Continuity Programs, outlined the continued evolution of the Integrated Public Alert and Warning System (IPAWS). In that context, he also provided a positive report to the summit attendees on the testing of the current generation AWARN equipment at the IPAWS Lab in Indian Head, MD. He stressed how rich media – and “media rich” – solutions are crucial for reaching the American public with emergency alerts in a timely and accessible manner. Chris Anderson, division chief at the FCC’s Public Safety and Homeland Security Bureau, described the Commission’s focus on improving alerts. He stressed the importance of rich-media, interactive solutions like AWARN in achieving the government’s goals for reaching all Americans. He said his bureau is also looking at ways that data flows to and from disaster victims to enable better decision-making both for those in harm’s way and for responders. Pete Sockett, director of engineering at Capitol Broadcasting’s WRAL in Raleigh, NC, described WRAL’s leading role in demonstrating AWARN’s predecessor technologies based on Mobile DTV. He also reflected on broadcasters key role as the original “crowd-sourcers” with newsrooms nationwide receiving information from viewers and from state, local, and federal officials on a daily basis. “Broadcasters, with their one-to-many architecture, are also leading the way in ‘many-to-one’ crowdsourcing, now through social media, in emergencies,” said Sockett. ATSC 3.0 was the focus at the next panel, “Video Quality and Data Applications.” Dr. Rich Chernock, chief science officer for Triveni Digital, and Madeleine Noland, representing LG Electronics and its Zenith R&D Lab, explained how the new standard will allow for a more robust signal to be carried and the many advanced services that are inherent in ATSC 3.0. Both key players in leading the industry group developing ATSC 3.0, Chernock and Noland pointed out that advanced emergency alerting is a core component of the new standard. Michael Poth, CEO of the U.S. Commerce Department’s First Responder Network Authority (FirstNet), presented a compelling overview of the nation’s emergency warning infrastructure during the afternoon keynote. He detailed FirstNet’s vision of an LTE-based first responder communications network that will have many ‘fail-safes’ built in. He encouraged the broadcast industry to partner with other vendors and to develop a solution that could provide a backstop for delivering mission-critical video and other information to first-responders. He announced that FirstNet should release its major RFP for the network’s prime contractor by the end of this year. Marci Ryvicker, managing director of Equity Research: Media and Cable, Wells Fargo Securities, and Anne Schelle, Pearl TV managing director, both expressed positive investment outlooks for the broadcasting industry after the upcoming FCC Spectrum Incentive Auction and adoption of ATSC 3.0. Both indicated that services like AWARN were important in themselves, but also help make the business case for 3.0. because AWARN will be a ‘real world’ demonstration of the power of ATSC 3.0 in a way that people can understand. A panel titled “Advanced Broadcast Public Warning – New Modes of Reaching the Public” examined how TV stations around the country are already leading the way for advanced alerting. Dr. Ed Czarnecki, senior director of Strategy & Global Government Affairs at Monroe Electronics, discussed current and future solutions for multi-lingual alerting. Chris Homer, Vice President Operations and Engineering at PBS, described the work within the ATSC 3.0 standards development process for advanced alerting and the strong interest among public broadcasters for AWARN. Dave Carwile, executive director of the Ohio Educational Television Stations, reported on their innovative system, funded by the Corporation for Public Broadcasting, which uses datacasting from public stations to support emergency communications. Rick Wimberly of Emergency Management Magazine moderated the panel. The afternoon culminated with a panel that examined real-world examples of how current-generation technology is being used to deliver encrypted, mission critical video to first responders. Moderated by TVNewsCheck’s Phil Kurz, presenters included SpectraRep President Mark O’Brien, Major David Mulholland (Ret.) formerly of the U.S. Park Police, and Joshua Adams, director of technology for Houston Public Media. Mulholland described the successful use of datacasting during mass crowd events on the National Mall. Adams presented a video case study of how a datacasting-based system in Houston tracked a person-of-interest moving through multiple surveillance cameras across several jurisdictions. 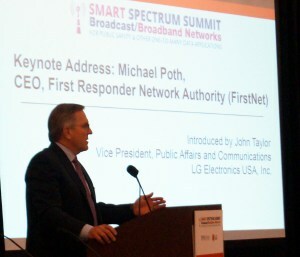 The Smart Spectrum Summit was a groundbreaking event that presented unique content from a chorus of expert voices across the media and public safety spectrum, so to speak. In a post-event survey, 90 percent of the respondents rated the overall conference as “Excellent” or “Very Good,” and 80 percent said they were “Extremely Likely” or “Very Likely” to attend a similar event in the future. Besides lead sponsors LG and ONE Media, other sponsors of the Summit included NAB Labs, Monroe Electronics, Triveni Digital, Capital Broadcasting, Zenith, and Pearl TV. AWARN demonstrations by Zenith during the coffee and lunch breaks showed the capabilities of advanced emergency alerting using the ATSC 3.0 Candidate Standard. The conference was co-produced by John Lawson and Fiona James of Convergence Services Inc. and Tim Downs and Tammy Fellows of Interwork Media. The Association of Public Safety Communication Officials (APCO), held its Emerging Technology Forum in Raleigh NC, on February 28 – March 1, 2017. AWARN Alliance members, Pete Sockett of Capitol Broadcasting Company, Fred Engel and Adam Woodlief of UNC–TV, presented. Their presentation concentrated on ATSC 3.0 and AWARN’s Public and Public Safety facing capabilities.